Facebook’s co-founder and CEO Mark Zuckerberg met China’s propaganda tsar Liu Yunshan in Beijing on Saturday as part of a charm offensive in one of the few markets where the social network cannot be accessed. The rare meeting, reported by China’s state news agency Xinhua, suggests warming relations between Facebook and the Chinese government, even as Beijing steps up censorship of and control over the Internet. Liu, who sits on the Communist Party’s Politburo Standing Committee which is the apex of power in China, praised Facebook’s technology and management methods, Xinhua said. Zuckerberg was in Beijing for the China Development Forum, a government-sponsored conference bringing together top business executives and the country’s ruling elite. China “hopes (Facebook) can strengthen exchanges, share experiences and improve mutual understanding with China’s Internet companies”, Xinhua quoted Liu as telling Zuckerberg. Facebook Inc (FB.O) and Twitter Inc (TWTR.N) are vying to buy rights to stream conventional TV programming, the New York Post reported on Thursday. Both companies have approached programmers about a deal, the Post said, citing several sources familiar with the situation. Facebook, which is already in talks with the National Football League for digital rights to Thursday Night Football, has met with a wide range of TV executives over the past few weeks, sources told the Post. However, it was not known how Facebook would deliver the shows, sources who heard the pitch told the newspaper. “Our goal with live video is to work with our partners to move to a sustainable monetization model quickly,” Facebook said in a statement. TOKYO Taiwan’s Foxconn is lowering an offer for loss-making Japanese electronics maker Sharp Corp from an initial plan of 489 billion yen ($4.4 billion), the Yomiuri newspaper reported on Sunday. WASHINGTON The U.S. government and Apple Inc will be able to cross-examine the other’s witnesses in a court hearing next week on whether the technology company must help federal investigators unlock an encrypted iPhone tied to one of the San Bernardino killers, Apple said. Facebook Inc and Twitter Inc are vying to buy rights to stream conventional TV programming, the New York Post reported on Thursday. CAPE CANAVERAL, Fla. A Russian Soyuz capsule carrying a NASA astronaut and two Russian cosmonauts arrived at the International Space Station on Friday, ending a nearly six-hour flight, a NASA TV broadcast showed. LOS ANGELES The pilot of a Lufthansa passenger jumbo jet reported a drone aircraft nearly collided with the airliner on Friday on its landing approach to Los Angeles International Airport, according to the Federal Aviation Administration. A senior editor for Billboard magazine on Friday called an agreement over royalties reached between Spotify and the National Music Publishers Association “a win” for songwriters and for the music streaming service. Twitter Inc’s 140-character tweets are here to stay, Chief Executive Jack Dorsey said on Friday, ending speculation that the microblogging site might abandon one of its trademark features for a 10,000-character limit. If your CPU has only a single core, it’s officially a dinosaur. In fact,quad-core computing is now commonplace; you can even get laptop computers with four cores today. But we’re really just at the beginning of the core wars: Leadership in the CPU market will soon be decided by who has the most cores, not who has the fastest clock speed. What is it? With the gigahertz race largely abandoned, both AMDand Intel are trying to pack more cores onto a die in order to continue to improve processing power and aid with multitasking operations. Miniaturizing chips further will be key to fitting these cores and other components into a limited space. 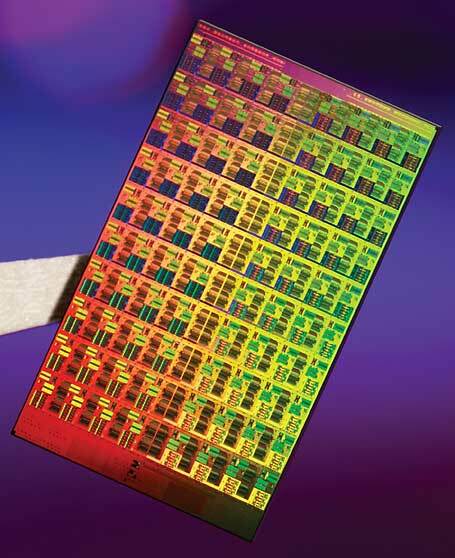 Intel will roll out 32-nanometer processors (down from today’s 45nm chips) in 2009. After that, the timeline gets fuzzy. Intel reportedly canceled a 32-core project called Keifer, slated for 2010, possibly because of its complexity (the company won’t confirm this, though). That many cores requires a new way of dealing with memory; apparently you can’t have 32 brains pulling out of one central pool of RAM. But we still expect cores to proliferate when the kinks are ironed out: 16 cores by 2011 or 2012 is plausible (when transistors are predicted to drop again in size to 22nm), with 32 cores by 2013 or 2014 easily within reach. Intel says “hundreds” of cores may come even farther down the line. Since the dawn of electronics, we’ve had only three types of circuit components–resistors, inductors, and capacitors. But in 1971, UC Berkeley researcher Leon Chua theorized the possibility of a fourth type of component, one that would be able to measure the flow of electric current: the memristor. Now, just 37 years later, Hewlett-Packard has built one. What is it? 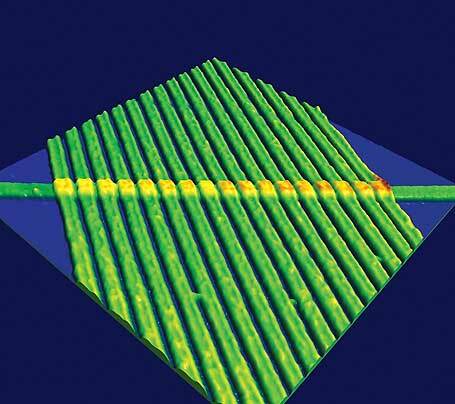 As its name implies, the memristor can “remember” how much current has passed through it. And by alternating the amount of current that passes through it, a memristor can also become a one-element circuit component with unique properties. Most notably, it can save its electronic state even when the current is turned off, making it a great candidate to replace today’s flash memory. 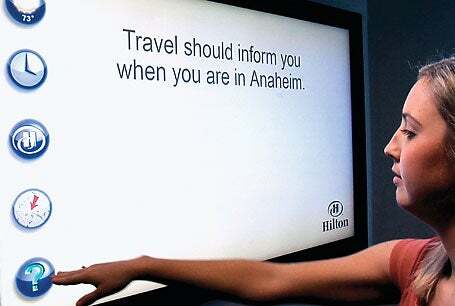 Soon you’ll be able to simply point at your television and control it with hand gestures. We love our mice, really we do. Sometimes, however, such as when we’re sitting on the couch watching a DVD on a laptop, or when we’re working across the room from an MP3-playing PC, it just isn’t convenient to drag a hockey puck and click on what we want. Attempts to replace the venerable mouse–whether with voice recognition or brain-wave scanners–have invariably failed. But an alternative is emerging. What is it? Compared with the intricacies of voice recognition, gesture recognition is a fairly simple idea that is only now making its way into consumer electronics. The idea is to employ a camera (such as a laptop’s Webcam) to watch the user and react to the person’s hand signals. Holding your palm out flat would indicate “stop,” for example, if you’re playing a movie or a song. And waving a fist around in the air could double as a pointing system: You would just move your fist to the right to move the pointer right, and so on. When is it coming? Gesture recognition systems are creeping onto the market now. Toshiba, a pioneer in this market, has at least one product out that supports an early version of the technology: the Qosmio G55 laptop, which can recognize gestures to control multimedia playback. The company is also experimenting with a TV version of the technology, which would watch for hand signals via a small camera atop the set. Based on my tests, though, the accuracy of these systems still needs a lot of work. Gesture recognition is a neat way to pause the DVD on your laptop, but it probably remains a way off from being sophisticated enough for broad adoption. All the same, its successful development would excite tons of interest from the “can’t find the remote” crowd. Expect to see gesture recognition technology make some great strides over the next few years, with inroads into mainstream markets by 2012. Intel, the global IT firm , has rolled out its programme on digitisation of rural India – called “EkKadamUnnati Ki Aur” – from Telangana. It now plans to work with 10 states across the country. The company launched its first ‘Unnati Kendra’ in India at an event in Hyderabad on Wednesday, November 18th. This ‘Kendra’ or centre in Telangana has been set up at a common services centre facility in Nadimpalle village in Mahbubnagar district of Telangana. These “Kendras” or centres will provide devices, relevant local content and digital training to local people in the village. DebjaniGhosh, Vice President, Sales and Marketing Group and Managing Director, South Asia for Intel, said the company intends to work with 10 states in India starting with Telangana. VangaNageswari, who leads the Unnati Kendra that has just been launched, operates a common services centre, where this is being offered and she is today training locals from 14 to 60-year-olds. The idea to develop this is to figure that out and create a reference plan or a blueprint and then work with the government, which is putting in a lot of money towards digitisation. Intel is launching this first in Telangana 1,000 villages are planned to involve in it. IT and services body Nasscom expects that IT companies would hire about 2.75 lakh during the current year, while the overall industry may grow by $20 billion. Reddy had earlier in June indicated that the hiring this year would be about 2.3 lakh. According to him, last year IT and services sectors touched $148 billion revenues. Nasscom recently said the Indian technology and services industry is on track to reach its goal of $225 billion in revenues by 2020 and further to reach revenues of $350 billion by 2025. He said the growth in revenues is largely due to adoption of ‘disruptive’ technologies in terms of automation and knowledge-based workforce coming into the sector. On the impact of floods in Chennai on the IT industry, Reddy said most of the big companies have already taken precautionary measures and avoided troubles. On the market outlook, he said it is stable and positive. He, however, opined that the disturbances in some of the regions may have some impact in the long-run. 1 Bengaluru Bengaluru is known as the Silicon Valley of India and IT Capital of India. With largest software exports from India, Bengaluru is considered to be a global information technology hub. Bangluru is not only known for having headquarters of Indian IT service providers like Infosys and Wipro, but also headquarters of many renowned global firms like, Intel, Texas Instruments, Bosch, Yahoo, SAP labs, Continental and many more. With about 5000 companies, Bengaluru alone is the home of more than 35 percent of all the IT companies present in India making it the largest IT contributor in India. 2 Chennai Chennai secures a second place as the largest exporter of IT and ITES of India. Accenture, Cognizant, TCS, Syntel, Wipro, Infosys, Verizon, L&T, HCL, Amazon.com, eBay, Paypal, Polaris, Patni, Capgemini and many major global providers are having operation centres at Chennai. That’s why the city enjoys its nickname as IT expressway. The city’s strong industrial base also favors setting up of many major R&D centers in its vicinity. 3 Hyderabad Hyderabad is known as HITEC City or Cyberabad. And the glamour of the city is to be the largest bioinformatics hub of India. It has become the first destination for the Microsoft development centre in India and largest software development centre outside of their headquarters in Redmond, USA. Microsoft, Infosys, Google, Cognizant, Tata Consultancy Services, Computer Sciences Corporation, Accenture, Facebook, Wipro, HCL, Cyient, IGATE, Capgemini, Polaris, Amazon.com, Dell, Deloitte, Tech Mahindra etc., and close to 5000 companies operate from the city. 4 Delhi The National Capital Region comprising Delhi, Gurgaon and Noida are clusters of software development. 5 Pune Pune is one of the biggest global IT services & outsourcing exporter of India. The next biggest IT park of India, Rajiv Gandhi IT Park at Hinjewadi, is expected to scale up to phase 7. It is also known as Tech City, which consists of many multinational corporation companies such as TCS, Tech MahindraCapgemini, Syntel, Infosys etc., and is one of the IT hub of India. Pune is also C-DAC headquarters. Windows 10 operating system (OS). Microsoft India Chairman BhaskarPramanik said that the devices are designed for Windows fans and professionals who desire a premium phone that takes full advantage of Windows 10. Lumia 950 (Rs 43,699) and Lumia 950 XL (Rs 49,399) are the first Lumia phones to come pre-loaded with Windows 10 in India. The flagship devices include innovative features like Cortana, Windows Hello beta for Lumia and Continuum for phones”, Microsoft India General Manager Ajey Mehta said. He however declined to comment on the sales targets for the devices.Customers can pre-book the devices starting November 30 at Microsoft Priority Resellers, Microsoft Store on Amazon.in and retail chains of Croma, Reliance and Sangeetha. The devices will be available from December 11.The devices come loaded with the ‘Continuum’ feature which when connected to a supported Display Dock beams all the apps to a larger screen. The dock has been priced at Rs 5,999, but will be free for initial buyers. The Lumia 950 features a 5.2-inch display, 1.8HHz Snapdragon hexa-core processor, 3GB RAM, 32GB internal storage (supports 200 GB expandable storage) and 3,000mAh battery.Lumia 950XL sports a bigger 5.7-inch display and 3,340mAh battery. Both the devices feature a 20MP PureView rear camera with triple LED flash and a front camera of 5MP with wide angle lens. Lumia 950XL will feature liquid cooling technology to dissipate the heat, Mehta said. The government will soon start an Electronics Development Fund with a corpus of Rs 10,000 crore to provide financial assistance to domestic companies in the field of electronics manufacturing and encourage innovation in the sector. Department of Electronics and IT (DeitY) Secretary JS Deepak said the fundof Rs 10,000 crore, housed with Canbank Venture Capital Fund, will start this month with an initial corpus of Rs 2,500 crore and rest will be raised from various sources. At the event, Qualcomm announced $4-lakh corpus for development of electronic products by Indian entrepreneurs under its ‘Design in India’ programme in association with IT industry body Nasscom. “The company creating a product under the Design in India programme will own IPR for it. Under the programme, Qualcomm has invited participation from people who can innovate in the field. The last date for application is February 29. It will shortlist 10 entities which will be eligible for funding of $10,000 each to start prototyping their product idea at Qualcomm’s lab in Bengaluru. Thereafter, it will select three best products and give them funding of $100,000 each. “India has strength in IT and that strength also includes design, engineering and R&D. Engineering export from India was around $18.1 billion in 2014-15. This is the fastest-growing segment within IT industry. This is expected to reach $40 billion by 2020. Design is something that you do before developing product. IT is not delinked from manufacturing,” Nasscom President R Chandrashekhar said. He said that DeitY has also selected Nasscom to set up an incubation centre for developing an Internet of Things (IOT) ecosystem. “The centre is coming up in Bengaluru with initial cost of Rs 25 crore to incubate ideas around IoT and encourage domestic entrepreneurship,” Chandrashekhar said.